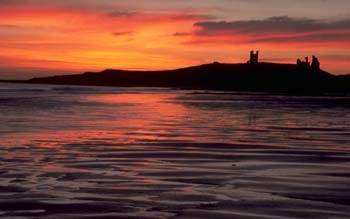 Dunstanburgh Castle is the largest castle in Northumberland covering 11 acres although only fragments remain today. Set against a glorious seascape it is an impressive sight, especially after dark. The castle is steeped in history and haunted by several famous ghosts. I carried out a two night investigation here in the hope of experiencing something paranormal myself. Dunstanburgh Castle is home to many ghosts. The ghost of Thomas, Earl of Lancaster, who built the castle, still walks the castle grounds. King Edward II had Thomas executed for treason in 1322. The executioner was incompetent and it took 11 strokes to finally cut off the head of Thomas. Not a pretty sight as you can imagine and even hardened warriors fainted during this bloody farce. The Earls' ghost has been spotted around the castle carrying his mangled head, with a face that still expresses the pain and horror he suffered before the final blow finally took his life. Margret of Anjou (wife of Henry VI) is seen and heard weeping for the people slain in the Battle of Hexham in 1464. Another resident, and probably the most famous, is the ghost of Sir Guy the Seeker. Sir Guy was a knight who stumbled upon Dunstanburgh Castle whilst on his search for the Holy Grail one dark and stormy night. As he approached a warlock appeared. The warlock told him that a beautiful young lady was held captive in the castle in need of rescue. All of a sudden lightning struck the ground before Sir Guy and a giant snake appeared with venom so poisonous it melted stone. Guy put up a fight but the snake wrapped himself around Sir Guy and was about to sink his fangs into him when the Warlock cast a spell and turned the snake to dust. The brave knight rushed into the castle grounds at which point he found himself surrounded by over a hundred knights. These were no ordinary knights however, there was no skin on their bones - This was the Army of the Dead, hollow eyes stared at him from every angle, some of them screamed at the sky in defiance. Before him on the ground lay the beautiful prisoner, a look of sheer terror on her face and her body paralyzed with fear. Two 8 foot tall skeletal knights stood before Sir Guy, one carried the Horn of Merlin, stolen from Merlin by the evil wizard Mordred, the other carried a huge sword, some legends say it was Excalibur and others say it was a magical two handed sword sent down from Heaven. The warlock told Guy to choose, all his instincts as a great knight told him to choose the sword and take on the undead, but he chose the horn. The knights slowly approached, Guy blew the magical horn, and all of a sudden he was back outside the castle. Whether he chose wrongly, or if this was his punishment for not choosing the sword and taking on this Army from Hell is unknown. His ghost can be seen still forever wandering outside the castle trying to find a way in to rescue the lady. His cries of anguish can often be heard at midnight. It's also said if you look at the ruin of Dunstanburgh from a certain angle, the outline of the building looks just like a key, perhaps the key Sir Guy seeks. Friday the 10 September was to be the first night of a two night vigil at the castle. I was joined by my friend Ryan Elwell. The two of us set off at about 8:45pm with an hours drive ahead of us. As we drove I told Ryan the stories and legends of the castle to set the mood. After a lot of driving along dark country lanes we arrived outside of a pub next to Craster harbour. This was as close to the castle as we were going to get by car, we would have to complete our journey to Dunstanburgh Castle on foot. We got out the car and looked in the direction of the castle – absolute darkness. We put our fleeces on, armed ourselves with a torch and a digital camera each and headed out through the fields, away from civilisation, away from the well lit houses and street lights into absolute darkness. At this point, although I was a little apprehensive about what lay ahead, I was more concerned about the group of charvas who had been hanging about not far from where I parked. Not necessarily concerned about them giving us abuse, but worried they’d follow us and ruin our investigation. We decided to keep our torches off so we weren’t seen and wandered blindly in the direction of the castle, there was total silence except the rumble of the North Sea literally metres from where we walked. We walked further and further into the darkness until we thought we were far enough away from the houses to turn our torches on. Ryan turned on his torch and shone in into the darkness and an illuminated face appeared in his beam only inches in front of him. He jumped and shouted “F**k, there’s people!” making me jump just as much. He walked quickly and silently in the other direction. I didn’t believe anyone would be out here in the middle of the night without a torch so I shone my torch right in their faces alternating between the faces of a middle aged man and a middle aged woman, they smiled back at me, despite me blinding them. “Hello” the man said politely, my panicky reply was “you’re out here in the middle of the night with no torches, are you mental?” “We went for a picnic” the man replied as if it was the most natural thing in the world. It was now 10:05pm and very, very dark and had been dark for at least a couple of hours. I was right, they obviously were mental (or maybe they had been for a ‘picnic’ wink, wink, nudge, nudge. Aye, you know what I’m getting at). We continued onwards towards the castle, Ryan still very shaken by what had just happened. He said it was the most scared he had ever been in his life, hopefully when we reached the castle we’d see something to scare him even more. After more walking we could finally make out an enormous black silhouette in front of us. Dunstanburgh Castle. It looked incredibly menacing and uninviting in the darkness as we got ever closer. We both stopped in our tracks, Ryan asked if I could see a large luminous shape outside the castle, I could. We walked slowly towards the castle we were only a hundred metres or so away now and we could still see the luminous object. We approached the fence surrounding the castle and whatever it was had gone. There was a large white sign stating prices and opening times but this was a good 5 or 10 metres away from the entrance where the shape had been. We were right in front if the castle now. As we nervously walked through the stone entranceway to the castle, I half expected someone or something to walk out of the shadows. I didn’t see a ghost but I had a feeling that we weren’t alone at Dunstanburgh Castle. We did see a glowing white object outside the castle, perhaps the ghost of Sir Guy? We’ll never know for sure. Hopefully our second night will prove to be more eventful. On the evening of our second investigation Ryan and I were joined by Harry Dalton and Thomas Kirkup. Everyone was very excited about the night ahead, I filled in the lads about what happened when we were there two nights previous as well as the stories of the castle. It was a fairly mild evening but pitch black by the time we arrived in Craster at 9:45pm. I put new batteries in my torch, donned my fleece and picked up my digital camera, I was going to bring my EMF metre but hadn’t had chance to conduct any baseline tests so it would have been pretty pointless. The other lads were ready to go so off we set across the fields, once more into the darkness. As we made our way we noticed some strange lights in the distance, it looked like torch light being shone in the sky from inside the castle, it looked like we were going to have company on our trip to the castle, whoever was already there might not take kindly to us joining them, but if they did then it might work out well because we can share information and experiences. We carried on walking. Tom calmy said “dog” as we walked. “What?” I said. “There was a dog just walked past us, didn’t you see it?” No one had. Surely we’d have heard a dog especially considering we were all walking in absolute silence. Where was it’s owner? He pointed to the grass next to us “I saw a big dog shaped thing pass us there”. It could have been imagination, but could it have been a phantom ghost dog wandering the fields? Our night had got off to a great start and we hadn’t even reached the location of our ghost hunt yet. The lights from the castle seemed to be far too bright for a torch but were irregular so couldn’t be the lighthouse that is behind the castle, if the lighthouse light could be viewed from where we were now surely Ryan and I would have seen in on Friday night when it was darker. There must be someone at the castle, we were going to find out sooner or later. “We could sneak in and scare them” Ryan suggested. “Brilliant idea if you want your teeth kicked in” was my reply. We reached the castle fence, we had our torches off and looked for any signs of ghost hunters inside. The lights had stopped. In the darkness Tom and I could make out a moving shadow at the other side of the entranceway looking back at the four of us stood at the fence. “Hello” I shouted, the only reply was what sounded like my echo saying “hello” back at me. We stood there for about five minutes “Sod it” I thought making my way to the entrance. “Hello” I shouted again, the last thing I wanted was to enter the castle and have someone jump out of the darkness at me, I led the team cautiously into the castle courtyard. “We come in peace” I shouted, still no reply. We stood back to back in a square in the centre of the courtyard. There was no one here. Where had the lights been coming from? Had there been a black shadow creature looking back at us from the opposite side of the entrance? Was it imagination? We decided to explore the grounds to hopefully find some answers. We headed to the tower at the back of the grounds. There was definitely no one here. We saw the lighthouse the only possible source of the light we had seen earlier but I still wasn’t convinced. If anyone had been here the only way out would be to pass us. None the less we put it to the back of our minds and continued our investigation. This night was much clearer than the earlier trip and the castle was a breathtaking sight in the darkness. The atmosphere was electric and I don’t know about the other lads but I was positive this was going to be a successful night. We wandered the grounds and made our way to an area just to the left of the main courtyard. I heard a bell ring. “Did you hear a bell?” whispered Harry, he’d confirmed what I had just heard. “Let’s investigate” he said so the two of us walked towards the ringing noise. It was still in the back of my mind that it was still possible we weren’t alone here so I was doubly cautious, continuously looking behind me. I could still hear the ringing but we couldn’t find anything that could be making that noise. “OK, let’s try and communicate with whatever is here” I said. Everyone was game except Ryan who was a bit reluctant, I wanted to conduct a séance but instead we agreed that I’d just talk aloud and ask the spirits to give us a sign. We went back to the main courtyard and the torched were turned off. “Hello is there anybody there?” I shouted. I waited. Ryan whispered “You had to watch Most Haunted to learn that?” “We don’t mean any harm, we come with complete respect for you, if there is anyone there can you give us a sign? Make a noise, make something move, anything”. We waited. Nothing. We turned our torches back on, well at least I tried too, my torch wouldn’t come on. It couldn’t have been the batteries they were brand new and showed no signs of fading. Was this my sign? Ryan’s mobile in his pocket had turned itself off too even though the battery wasn’t flat. Also, unknown to me until I got home and uploaded my photos, on every photo taken in the castle grounds after trying to make contact with the other side there are orbs on the photos. It wasn’t raining and there’d been no orbs on any of the previous photos taken in the same area in the same conditions. It looked like we were having some success at last. We split up and explored two tunnels into the keep from the courtyard, I went with Ryan, and Tom and Harry went to the other one. I was now effectively blind without a torch in the pitch black so I had to rely on Ryan to guide me, he didn’t seem to realise and wandered off leaving me to negotiate some awkward steps in the dark. We went into a little room and as I looked around, Ryan screamed and made me jump. A bird moved in a window in front of him. “Howay man! You nearly scared me to death it’s just a bird for Christ’s sake!” I shouted at him. Harry and Tom came running to see what was happening. As we left the room we noticed a bird perched on the wall, it didn’t seem too bothered about us being there and Ryan even stroked it. We went back to the courtyard for another look around and Harry said to me “I get the feeling someone or something is up there watching us” while nodding towards the upper windows in the keep. This was the same feeling I’d had on the Friday night and also throughout this night. The next 30 or so minutes passed by fairly uneventfully so we decided to call it a night. As we walked back to the car however I noticed that there was no longer any lights coming from the castle. I didn’t see a ghost but it was by far the most eventful evening I have experienced during my investigations. So much happened, the strange dog seen by Tom in the field, we’ll never know what that was if anything but I find it incredibly interesting. The feeling of being watched from the upper windows. The bell ringing. My torch breaking and Ryan’s phone going off when I tried to make contact with the spirits. The orbs seen on the photos above which were taken after my attempt to reach the other side. I still don’t have any solid proof of the existence of ghosts but I’m getting closer. Dunstanburgh Castle is definitely worth another visit at some point, maybe third time lucky.